Ever since the clock hit triple zeros in game four of the NBA Finals, creating a third championship in four years for the Golden State Warriors, the offseason has been wild. For those who thought that last year’s offseason was controversial (with Gordon Hayward, Kyrie Irving, Paul George, and other All stars all landing on new teams), this offseason has had a much greater impact. June 21st…the NBA Draft…where college superstars became pros. The Phoenix Suns drafted power forward DeAndre Ayton out of the University of Arizona. 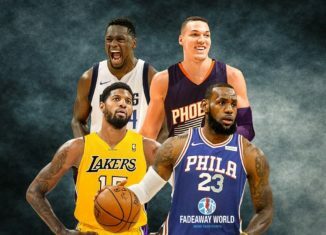 It looks as if they are rebuilding their team since they now have Ayton, Josh Jackson, and Devin Booker who are all 21 years old, or younger. On June 25th, the NBA Awards show presented awards for many categories. The two categories that stood out were Most Valuable Player and the Rookie of the Year. James Harden won the MVP Award. Harden had an outstanding season, which is so hard to believe since he was once the 6th man on the Oklahoma City Thunder alongside with Russell Westbrook and Kevin Durant. Ben Simmons of the Philadelphia 76ers won the Rookie of the Year Award over Donovan Mitchell of the Utah Jazz. This was a surprise to many fans after an outstanding season by the Jazz point guard. On July 1st, LeBron James signed with the Los Angeles Lakers. This move by “The King” made many fans angry, and they defaced murals of LeBron in L.A. LeBron joined the Lakers to help get them back to doing that which their franchise was once accustomed to winning championships. This addition to the Lakers franchise can hopefully renew the Lakers-Celtics rivalry as it is now Lebron vs Kyrie Irving, who were once teammates on the Cleveland Cavaliers. LeBron isn’t only joining a team with well-known players, such as Lonzo Ball and Brandon Ingram, he’s joining a franchise of all-time greats, including Magic Johnson, Kobe Bryant, and Kareem Abdul-Jabbar to name a few. He may potentially get the number 23 retired and up on the rafters alongside these Laker legends. The day after LeBron was signed, DeMarcus Cousins, who is arguably the best center/big man in the NBA, signed with the Golden State Warriors. Cousins will be alongside two of the best shooters of all time in the backcourt (Stephen Curry and Klay Thompson), one of the most elite scorers of all time at small forward (Kevin Durant), and one of the best defenders in the NBA and former defensive player of the year (Draymond Green). This team is arguably the best team in NBA history. However, Cousins tore his achilles last year and probably won’t be playing until January. On July 6th, DeAndre Jordan signed with the Dallas Mavericks. Jordan was the last of the big three (alongside Chris Paul and Blake Griffin) on the Clippers to leave for a new team. By joining the Mavericks, Jordan will be playing with an international rookie sensation, Luka Doncic. He will also be playing with Dennis Smith, Jr., Harrison Barnes, and soon-to-be Hall of Famer, Dirk Nowitzki. The Mavericks organization has been rebuilding ever since Nowitzki (somewhat in his prime) and the Mavs upset LeBron James, Dwyane Wade, Chris Bosh, and the rest of the Miami Heat in the 2011 NBA Finals. During that same day, Tony Parker left the Spurs and signed with the Charlotte Hornets. Like Nowitzki, Parker is potentially a future Hall of Famer. Parker was part of a Big Three that is considered one of the best Big Threes in NBA history, which included Parker (very fast all-around player), Tim Duncan (arguably the best power forward of all time, who retired in 2016), and Manu Ginobili (one of the best shooters and international players of all time). Together, this Big Three won five championships. Manu Ginobili is the only one left on the Spurs, however, it is likely he will retire soon as he is 41 years old. Then, on July 18th, a blockbuster trade was made. The impactful portion of the trade is that the Toronto Raptors sent DeMar DeRozan to the San Antonio Spurs for Kawhi Leonard. Leonard is known for being one of the best defenders in the NBA, and he is also amazing at offense. Making him, arguably, one of the best two-way players in the NBA today. During this past season, Leonard didn’t play for two reasons: an injury and lacking any desire to be a part of the Spurs organization anymore. He, instead, requested to go to the Lakers with LeBron. Fans thought he may go to the Lakers, Celtics, or even the Knicks. DeRozan is known for his mid-range shooting on an offensive based team. For several years, DeRozan has been part of a duo with Kyle Lowry. The two of them were known to be one of the best backcourts in the NBA. DeRozan and Leonard were unhappy with where they ended up. DeRozan was upset with the Raptors organization, so Leonard didn’t want to go to the Toronto Raptors. This NBA offseason was almost as thrilling as the regular season and postseason. This October will feature players on new teams with future stars, and hopefully legends, in the making.